Who has a constant battle with dog hair?! Don’t ever think if you get a crossbreed (with a Poodle) that you will get a no/low shredding dog. 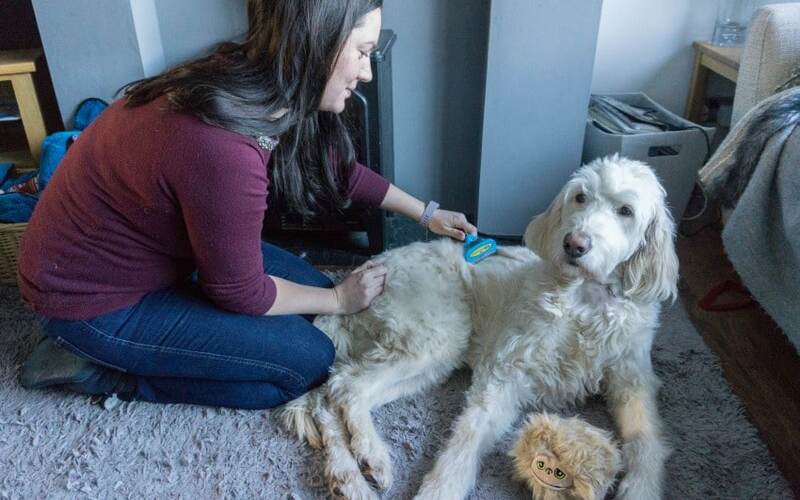 There are no guarantees on what type of dog hair you will get. 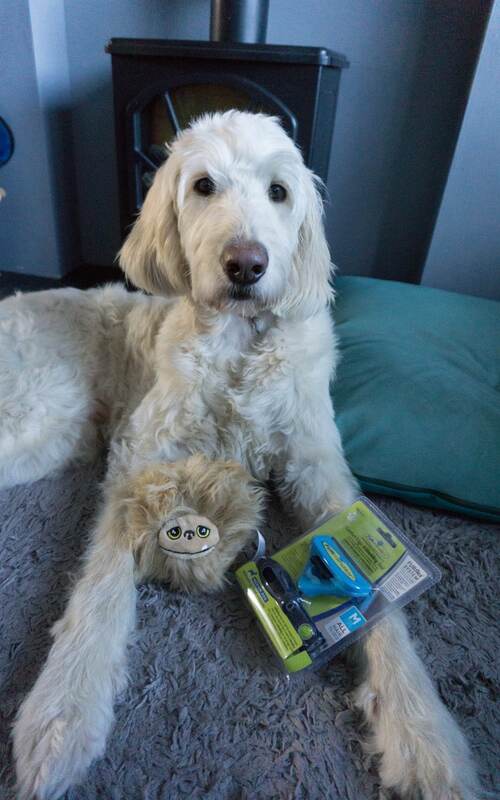 Gus is a Goldendoodle who does shred, not as bad as a full Golden Retriever, but I still need to vacuum every day. My shedding problem area is in the corners, or under the sofa. Little shedlings get everywhere!!! FURminator are a company that are trying to save me some work!! Thank You! They have create a fantastic range of products to help keep the shredding at bay. In the past we have used their de-Shedding grooming brush with great success, and I am always impressed by how much hair can come out. 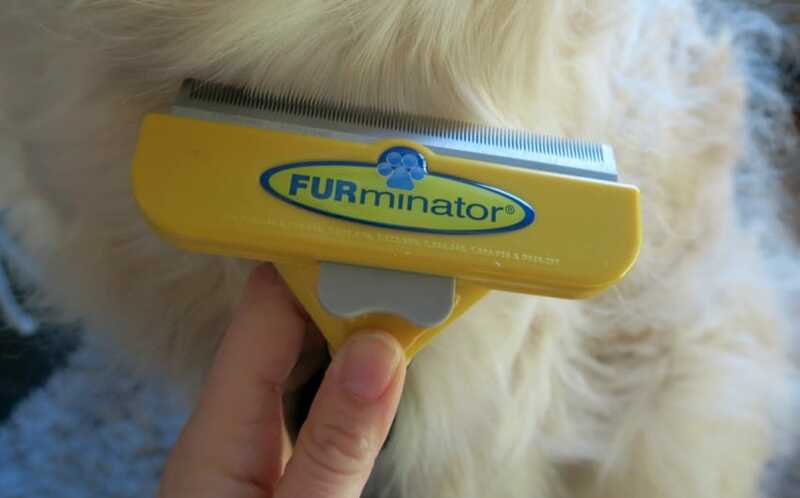 Although to make my life just that little bit easier FURminator has just released a new range of dog grooming products, the FURminator FURflex range. It is a grooming tool that has interchangeable heads. I love the FURminator range of brushes, but it’s another brush to add to the basket full of brushes that deal with different grooming jobs. The FURflex range means I can have just one brush that does it all. It also is great if you have a multi-pet household and need different type of brushes for different dogs, or even cats! You can easily swap the heads from de-shedding tool, grooming brush or comb. It was easy to change over with the FURlock release button on the brush handle, just make sure you give it a really good click in as it will come off when you are using it! I found that out as I thought it was clicked in, but just not quite. Their saying is……. When it clicks you know it fits! What Heads Can You Get? Gus is a big dog but I don’t keep his hair long either. Much easier to keep clean during walks, and to wash the mud out of after muddy walks. I spoke last winter about how I cope with muddy dog walks during the winter if you are looking for ideas. You can see it collecting here as I am brushing him. How Much Hair Does It Brush Out? 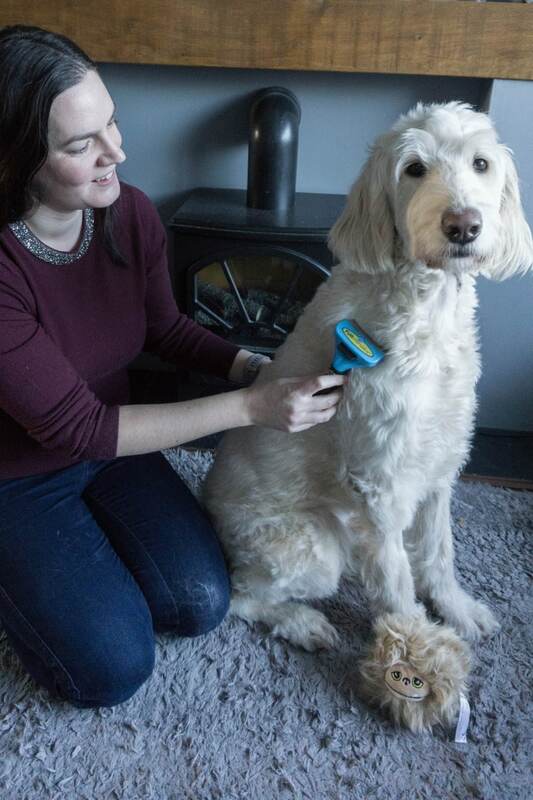 So having the FURminator does really help with the loose hair in Gus’s coat. Here you can see I only brushed him for a couple of minutes and all of this came out using the FURminator FURflex de-shedding tool. I love the fact that all that won’t be collecting in the corners of my home anymore. I have been giving Gus a very quick brush with this a few times a week and it has really helped with how much hair is shredded into the house. But I love that I can change the head over to a slicker brush head and just give him a little daily brush over too. Tip: Brush them outside in the garden as the hair flies out of them as you are brushing too! The birds can have it to keep warm in their nests too. 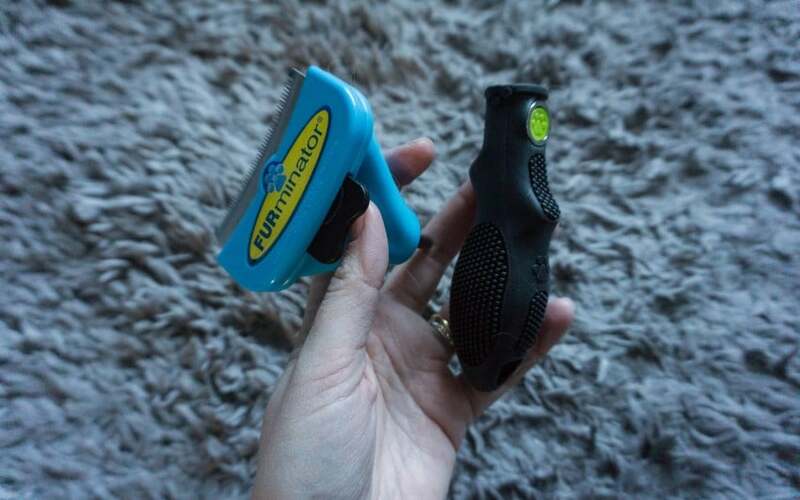 These products are worth investing in as as the initial FURflex tool starts at £35 for the handle and de-shedding tool and around the £10-£14 for each head. However I think dog grooming is worth the investment too. Matts in your dog are painful for them, they pull on the skin and can cause them quite a bit of pain and soreness. So purchasing good quality products that help are really worth it. 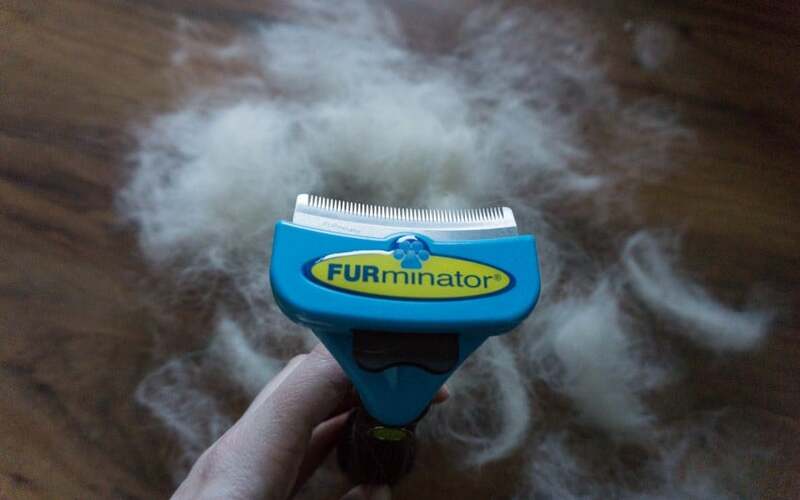 FURminator products are also very good quality too and will last. I can have a good clear out of all the bits and bobs in my dog box now, this does it all! 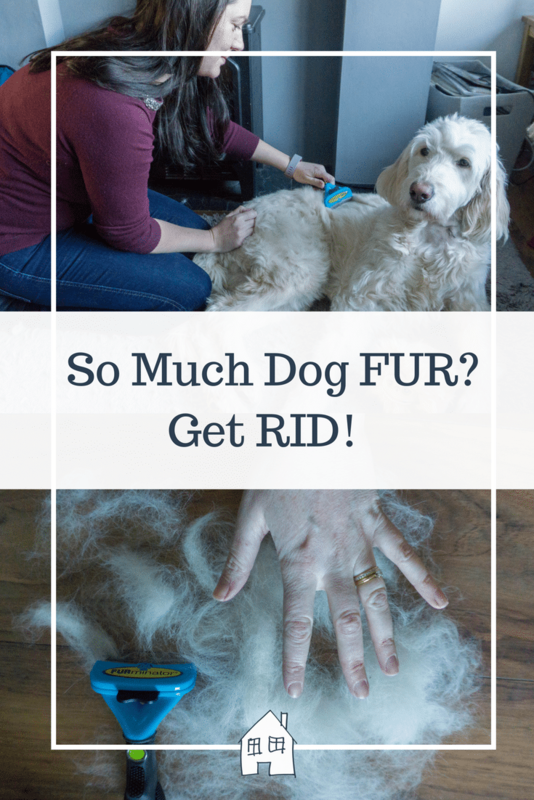 *Collaborative Post – I received the FURflex de-shedding tool for the purpose of this blog post. However all opinions are honest and of my own. hehe!! oh the dreaded post baby hair loss!!! Cute isn’t he!! But I am biased! My Mum had a long haired dog and he only had to look at something for it to be covered. 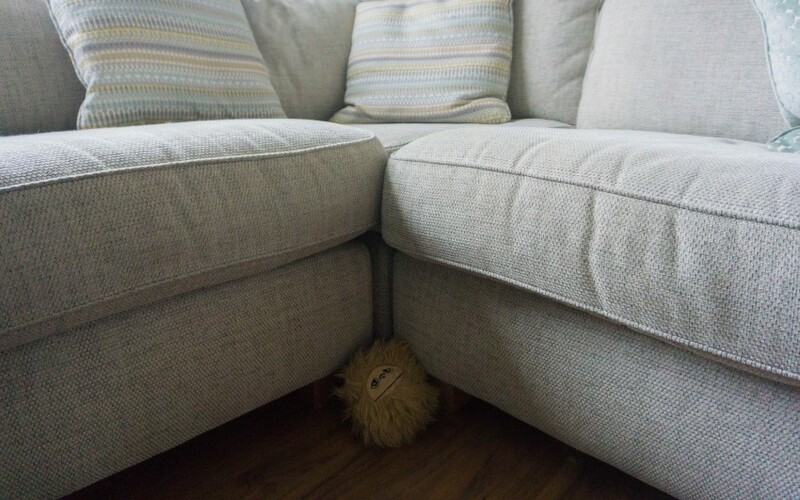 This looks like a great way to keep it under control. Thank you, why do they need to shred so much?! We don’t have any pets. But it looks like a very useful tool for pet owners to have. Wow! This is amazing! Also, your dog is SO beautiful! I can’t wait to move house later this year and finally get a dog! Ah thanks, he is a cutie. Oh how exciting!! Awww, such an adorable dog. My aunt has two big dogs and she finds it such a pain how much they shed their hair. This would be perfect for her two. Ah thanks, yes it would be perfect then, much less vacuuming! This looks amazing for pet owners. What a gorgeous dog. Thank you, hes pretty cute isn’t he! What a great tool for dog owners. It sounds super handy. Yep it’s brilliant, had to vacuum less since I started using it too! Bonus! Yep loads of hair! Yes dog groomers are pretty expensive, but it isn’t an easy job especially Gus as he is huge!! Gus is a beautiful dog! 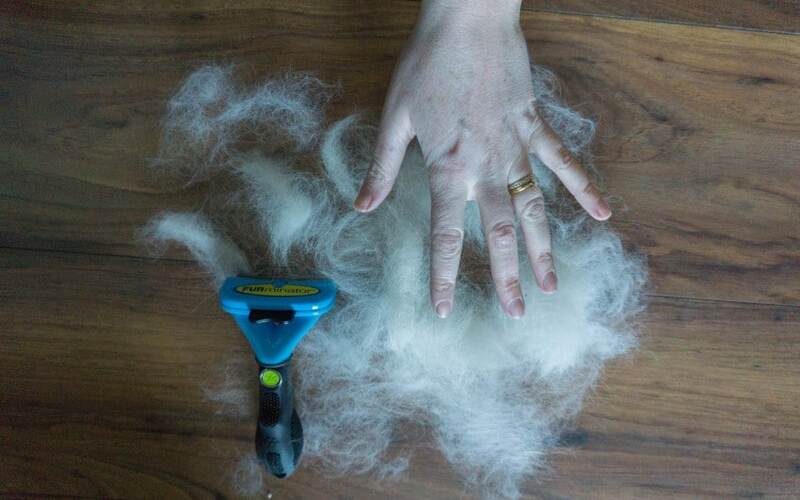 I’m making a mental note of this, because we are considering getting a Golden Retriever 🙂 Anything to reduce the shedding has to be a good idea, and that pile of fur is seriously impressive! Oh are you?! You won’t regret it they are such a lovely breed. SO loyal and family friendly, they just love every family member. I look forward to seeing cute puppy pictures if you do! Ah lovely Jack, you would have loved this for him. Gets out so much hair! 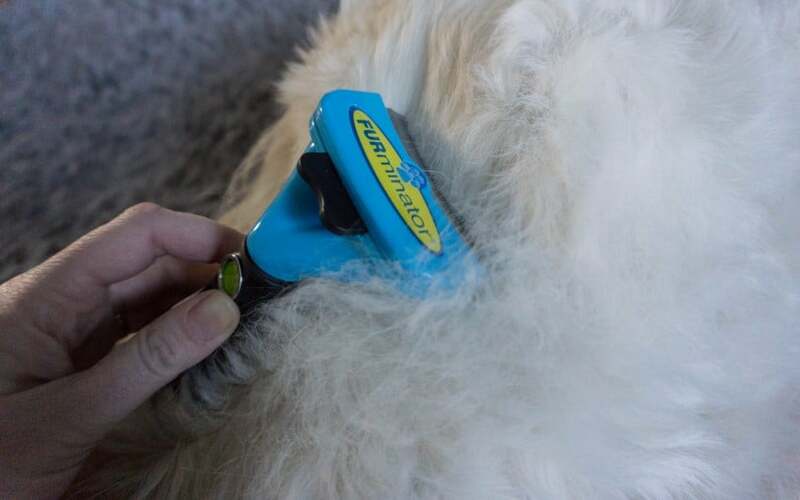 This looks like an excellent dog grooming tool! Thanks, it is certainly helping! Haha wonder why they love stairs to sleep on! Gus sleeps on the top little landing step!